Version 1.50 of MailShot is now available. This is our sixth big update since release, adding even more new features to MailShot. This update adds the most commonly requested feature from our tens of thousands of users- the ability to add contacts quickly from a checklist- and some new features to help catch contacts with badly formatted information. You can find most of the new stuff under the “import” button. Our MailShot support page is always available if you need it, or you can drop us a line if you need more assistance. NEW Quick addition of contacts from “All Contacts”, using a checklist. Tap “import” and select “Contacts Checklist”. This feature brings up a big list of all your contacts. Just set the check mark against the email addresses you want to import, and you can bring them all in at once by tapping on “Add”. Addresses that are already present in your group are displayed too (so you can see that the contact is already present even if they have more than one email address) but they are not selectable here, so you can’t remove them by accident. NEW Quick addition of contacts from groups, using a checklist. Tap “Import” and select “Address Book Group”. We had a few requests to import some contacts from an address book group without importing the whole group. This feature uses a checklist (this time with all the contacts and addresses selected by default) and you can deselect any alternative email addresses that you don’t want to include, or contacts you want to omit. Again, addresses that are already present in your group are displayed too, but do not have a check mark function. Tap “import” and select “Manual Entry”. We had a few requests from people who wanted to manually add contacts to MailShot without going through the address book system (as they didn’t want these people among their regular contacts?). This allows them to do just that. If you enter just an email address here, that will be used as the contact name. If these contacts are not present in your address book then their email addresses will be shown in red throughout MailShot, this is to highlight email addresses that are not present in your address book (in case they need attention,) but will not prevent MailShot from working. NEW Validity check of email addresses as they are added. If you are positive that an email is correct, you can temporarily disable this validity test in the Settings app on your device. If you have a lot of email addresses that don’t pass the test you can leave it permanently disabled, but if you do need to do this, please let us know the email addresses you are having a problem with. We have not had a single report of a valid email being rejected in the month since release. 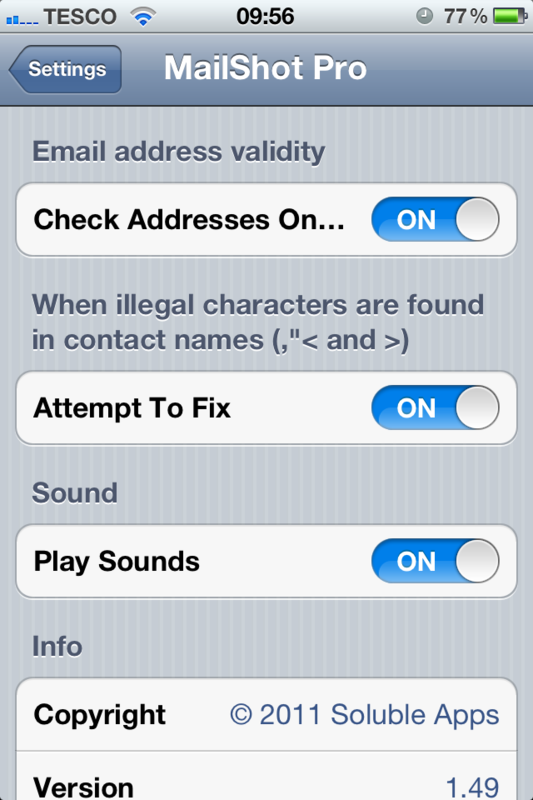 NEW Fix for bad contact names that include illegal characters. Some people have contacts with a comma, greater than, less than or quote mark in their contact names. This is illegal formatting, and causes the server to reject some groups, so this option wraps those contact names in quote marks, and swaps double quotes to single quotes. If this process causes a problem, it can be disabled in the Settings app on your device. NEW “Pro” graphic now appears on title screen when upgraded. A number of people were unsure whether or not they had upgraded from the free version correctly, so a (rather unsubtle) golden “pro” graphic now confirms this for them. NEW Cancel changes to contacts in a group. If you make changes to your group, then change your mind, you can now cancel all changes without writing them to your address book by tapping the ‘edit’ button on the contact add screen, then the ‘cancel’ button that appears. FIX Semicolon separator option removed. This option was more trouble than it was worth, as an incorrect setting here caused some people to only have a single contact receive their mail, so we have removed it with this update. NEW Updated icon with bevelled edges. This is just to make the icons for MailShot Pro and MailShot more similar to each other. Please remember that the App Store considers MailShot Pro and the in-app upgrade for MailShot as two different products. If you purchase both, Apple will charge you for both. See “Do I have to pay twice if upgrade again?” for more details on this and how to avoid it. As always, thanks for your support and suggestions, which we believe have helped make MailShot the best group email solution on the App Store for tens of thousands of people. If you get the chance we would love it if you could rate us again following the update, as all your fantastic ratings and reviews get moved to another page on the App Store every time we update. Much appreciated. Soluble Apps Powered by WordPress.com.